Staff Sgt. Edward Mims, 83, smiles and holds his Purple Heart Medal as well-wishers thank him for his service following a ceremony in his honor at the The Villages, a retirement community in Florida, Feb. 23, 2018. 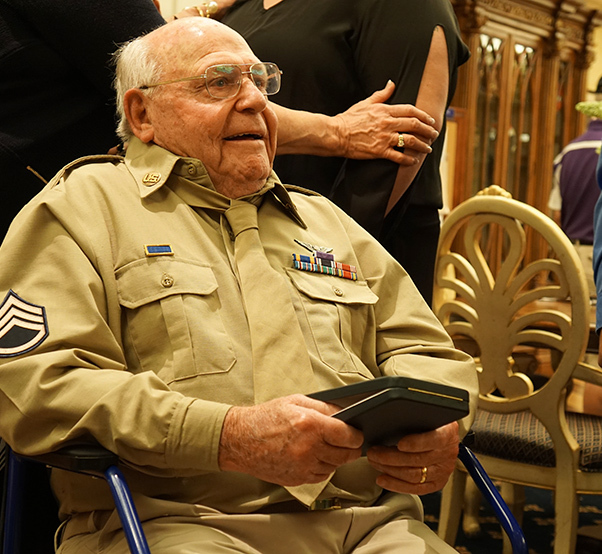 Mims was awarded the medal nearly 74 years after being wounded in World War II while serving as a top turret gunner on a B-24 Liberator bomber. Fort Stewart garrison command team Col. Jason Wolter and Command Sgt. Maj. Marty Conroy present the veteran his medal. On April 11, 1944, the “Kansas City Kitty”, a B-24 Liberator bomber assigned to the 566th Bombardment Squadron of the 8th Army Air Force out of Hethel, England, was shot down by enemy aircraft over Germany during World War II. On Feb. 23, nearly 74 years later, Edward H. Mims was presented the Purple Heart Medal for the wounds he received in the crashing bomber. He was 20 years old that fateful day; he’s now 83 and living in The Villages — a retirement community roughly an hour northwest of Orlando — with his wife, Sandi. Mims was the top turret gunner on the bomber, serving alongside 10 men. Seven men, including Mims, bailed out of the aircraft after it was hit by enemy fighter fire. One man’s parachute did not open. Mims and the surviving five men were captured and held as prisoners of war in Stalag 17B in Austria. He spent 390 days in the camp, where 4,000 others were held. Mims was liberated by U.S. forces on May 3, 1945, after enduring a westward 300-mile march after the stalag was evacuated in the face of oncoming Soviet forces encroaching from the east. 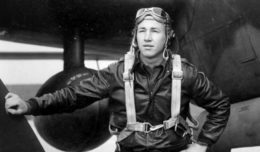 Being a POW “wasn’t a picnic,” Mims said. Gene Parent, a military veteran and resident of The Villages, and Mrs. Mims were instrumental in securing Mims’ Purple Heart. It took seven years of hard work and social media sleuthing to ensure Mims was awarded the medal he deserved. “There was enough eye witness documentation to show that Sgt. Mims received injuries from the fire that went up through his top turret position and burned his face, head, and hands,” Parent said. It also took the support of the Trump administration, Mrs. Mims said. “I am overwhelmed and have abundant joy and appreciation that my husband can be honored the way he should be honored,” she said. Fort Stewart-Hunter Army Airfield garrison command team Col. Jason Wolter and Command Sgt. Maj. Marty Conroy presented the Purple Heart to Mims in the community’s Eisenhower Recreation Center. It was a fitting location for the ceremony, with its museum vibe, showcasing artifacts from throughout the nation’s military history. Although long overdue, Mrs. Mims said her husband still endures the unseen wounds the war left behind. Mims started to open up about his service about eight years ago, roughly the same time Mrs. Mims bought tickets for him and her to fly in a restored B-24 on Father’s Day. Mims eyes’ lit up and he chuckled as Mrs. Mims described the experience. “”It was so barbaric and so cold and smelled like gasoline,” Mrs. Mims said. Mims said he was amazed people made an effort to restore a B-24. As part of the ceremony, Parent asked for a moment of silence to honor the crew of Mims’ Liberator.